Underdog stories have been the fuel of most media for decades upon decades. David versus Goliath, one versus many, the outcast versus the establishment, all are stories of humanity that people can relate to. Naturally, underdog stories have also made for some really good pro wrestling. This is one of those stories. But it’s also much, much more. It’s about reinventing yourself, finding the fire that burns within your soul, and becoming more than anyone thought you were capable of. For many years of his career, Kzy was a troubling character in the colorful landscape of Dragon Gate. From his debut in 2006, he was a low ranked roster member under the name of m.c.KZ, with his initial run culminating in Naruki Doi inviting him into WORLD-1 and a failed attempt at winning the Brave Gate title. 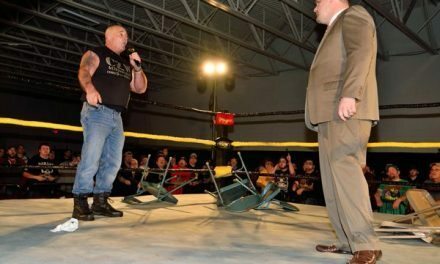 A losing streak shortly followed, and in 2009, the young MC snapped and turned heel, joining Real Hazard in the process. What would follow remains the one of the longest ever heel runs in Dragon Gate history. Real Hazard. Deep Drunkers. Blood Warriors. Mad Blankey. Heel units came and went during those years but one thing remained constant: Kzy’s membership in all of them, as the crooked jester with a screw loose, desperately looking for respect without being willing to do much to earn it. Even as a tenured member of the heel side, Kzy was never more than the last man in a team, the fall guy in a match, the mascot you keep around for your own amusement rather than a true teammate. 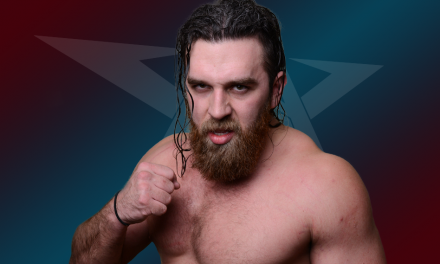 He picked up a few Triangle Gate reigns along the way, and when he got injured in late 2014, it seemed that would ultimately be his ceiling, stuck between the already made stars of the promotion and the new generation rapidly asserting themselves as the future. But throughout his entire career, Kzy has been nothing if not crafty. When the Open the Brave Gate title was vacated in December 2014 after Flamita refused the belt due to his defense against Punch Tominaga ending in a disqualification, it was put up for grabs in a tournament. In the finals, new generation wonder kid Eita went up against… Dr Muscle, a recurring character that had been played by a variety of wrestlers over the years. Dr Muscle came out victorious, but unlike the previous time the character had won the belt (in 2008, with Masato Yoshino playing the role), he did not unmask, nor did he vacate the belt. For a few days, fans were left wondering who the new Brave Gate champion could possibly be. Let’s set the scene. January 16, 2015, Korakuen Hall. Millennials vs Mad Blankey in a six-on-six main event. Dr Muscle, true to form as a heel character, is on the Mad Blankey team… Until he isn’t. Shenanigans occur, and a well timed powder attack from the good doctor allows new Millennials member Kotoka to get the pin on CIMA for the upset win. Shock courses through the audience, anger takes hold of Mad Blankey, and Dr Muscle removes his mask to reveal Kzy, now aligned with longtime friend BxB Hulk and his babyface dia.HEARTS stable. Since that unforgettable day three years ago, Kzy hasn’t stopped changing and improving, becoming everything many thought he never could. He lost the Brave Gate to Akira Tozawa just a short month later, but that never extinguished the fire he found during his time away. Instead he used each loss, each stumble, to become stronger, more resilient, to always push himself and move forward. In January 2016, almost a year to the day after his turn, Kzy pulled out all the stops in what many—rightfully—called his career-making performance. dia.HEARTS vs Verserk vs Monster Express, Losing Unit Disbands. Through the fast-paced, emotionally intense action that is par for the course in this type of contest, Kzy bloomed in front of our eyes. He bounced around the ring like a madman, bumped like it was his last match, fought like it was his last day on Earth. He got back up, time and time again, showing a side of him that had remained dormant for so long. Dragon Gate’s best kept secret. That day, his best efforts weren’t enough. That day he fell to YAMATO, and with him, dia.HEARTS came down too. But it wasn’t the end. When you have a heart as big as Kzy’s, it’s never the end until you say it is. The loss of dia.HEARTS may have been devastating to some, but for Kzy it was yet another chance to rebuild himself, to create something new. He took the pain and turned it into a new resolve, firing on all cylinders throughout the year. In May at DEAD or ALIVE, he was the leader of the rescue team for YAMATO, the very man who had taken everything from him. 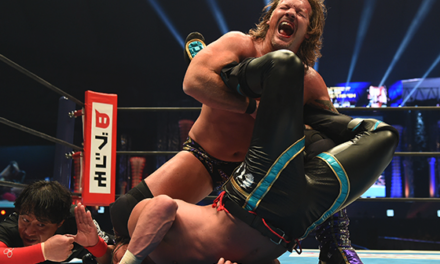 During the prestigious King of Gate tournament, he pulled out an impressive and, for him, history-making win against big bad boss Shingo Takagi. Kzy wasn’t sitting on the sidelines anymore, letting others fight his battles for him while he caused trouble. He became, against all odds and through sheer force of effort and will, someone to believe in. He showed off the skills that his heel persona had kept dull and unrefined in favor of shenanigans, and forged a new path for himself. From a trashy degenerate third-rate heel, Kzy became the heart of the Dragon Gate roster, ever-present and inspiring. In a promotion in dire need of new life following the departure of Akira Tozawa in November 2016, Kzy has become a beacon of light. A wrestler who fits everywhere on the card, because he’ll give 110% each time, someone who can rally crowds behind him, who can make you believe in everything he does, and who with every match, even in defeat, emerges a stronger man than he was before the opening bell. The biggest change, and what jumps out the most about Kzy, is how confidence seems to radiate from him. Not the kind of misplaced, twisted pride that dirtbag heels often emanate, but true self-love, the type that can only come from finally realizing and embracing your own worth. Out there in the ring where dreams are laid bare for the world to see, Kzy found himself. Whether it’s when he’s swaggering to the ring to the tune of his self-made theme song, setting the house on fire with a high energy performance, or celebrating with the fans after a big win, there’s is something special, a radiant energy, emanating from him at all times. Now, more than ever before, he is the true success story Dragon Gate needs. On January 16, 2018 in Korakuen Hall, three years to the day of his fateful, career altering face turn, Kzy pinned Open the Dream Gate champion Masaaki Mochizuki in a tag match. Not as he had done a few days before, with his patented Skayde Schoolboy flash pin, no. Kzy landed an elbow strike right to Mochizuki’s jaw, and got the one, two, three. And just like that, just for a moment, David toppled Goliath. Kzy, the scrappy and crafty underdog, who came from nothing and became something, had made a dent in the perennial Iron Man of Dragon Gate, the man who stands at the top of the food chain, a giant in his own right. And he laid down a challenge. For the Dream Gate title. For the right to prove his worth once and for all. For a chance to go toe to toe with the best, and win or lose, show the world what he’s made of. The Dream Gate title contest coming up on February 7 is, without a doubt, the biggest match of Kzy’s nearly 12-year career. It will be a test, of his strength, his resilience and his hunger. But most of all, it will be the culmination of the most unlikely and extraordinary journey. All eyes will be on Kzy. Many will be rooting for him to win, to open the door to his wildest dreams. But if he doesn’t? Then he won’t have lost anything, not really. Can we predict WWE TV Rights Fees for 2015?